Anti-fatigue mats are mats designed to reduce fatigue caused by standing for long periods on a hard surface (e.g., cement floors). Fatigue-reducing mats can be made of various materials including rubber, carpeting materials, vinyl, and wood. They can be used in dry, wet, oily applications based on material and type mat. 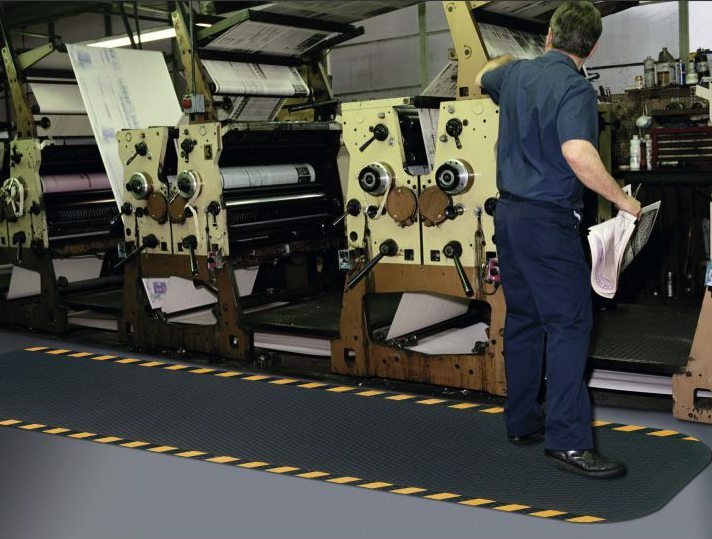 Anti-fatigue mats are often used to decrease foot and lower limb disorders for workers who stand in one position for long periods. However, providing a mat may not solve the entire problem. Discomfort, tiredness, and sore feet, legs, knees or hips after long hours of standing are the combined effect of several factors, namely the design of the work, the workers’ footwear, and the flooring material. According to scientific data, standing for long periods of time is particularly stressful and fatiguing. Regardless of the quality of shoes and quality of the floor covering, standing itself can cause tiredness after an entire working day.